As we approach its end, we are officially in the busiest (and best!) part of the school year. This past week, I witnessed firsthand many of our students in action, sharing their stories and talents in the district and community. At the Monday night school board meeting, we were treated to a baritone solo by one of our WHS students. On Tuesday, a WHS student and a WHS teacher shared their story of the transition program, which provides students with life and vocational skills. 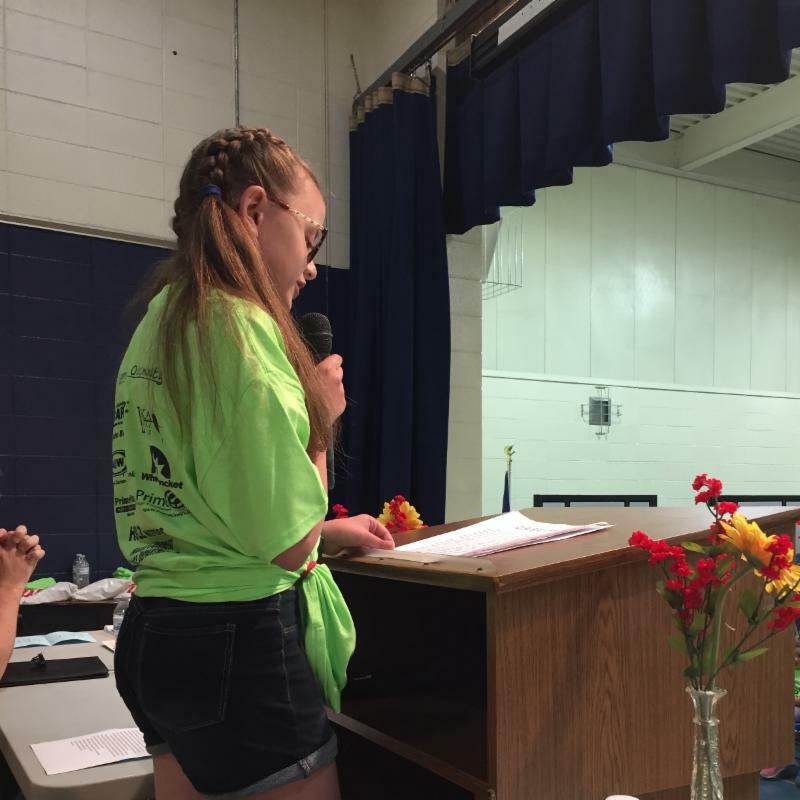 On Thursday, I participated in the DARE graduation at EES and and also heard a WMS student share her memories from DARE. Thursday evening, I celebrated with one of our WHS students who received a scholarship at the Hales Corners Chamber banquet. Have I mentioned how much I enjoy this time of the year? Check out this brochure for information on all of the programs taking place at Hales Corners Library over the summer! Board briefs are simple summaries of our board meetings. Without having to labor through or wait for the comprehensive board minutes, you can access what changes the board approved at each of their meetings! The latest board brief (for the May 14 meeting) has been posted. Check it out on the right sidebar of our Agendas & Minutes page. Interested in the items being considered at the next board meeting? Check out the board agenda for May 21 on the same page! Click here for more information and for registration! All registration forms are due no later than June 7th. Please take a moment to read this letter regarding the Season 2 premiere of 13 Reasons Why. The most recent governor’s budget provides funding, beginning in fiscal year 2019, to create a new mental health grant program (Wis. Stat. sec. 115.367). The Department of Public Instruction will award grants to school districts, and operators of independent charter schools, to be used for the purpose of providing mental health services to pupils, in collaboration with community health agencies. The Whitnall Pupil Services Team is working to apply for the grant in hopes of providing services during the 2018-19 school year. In order to have a better understanding of the mental health needs and concerns of our families, we request that you complete this brief confidential survey to provide your input. Please note that survey responses are confidential and names/other identifying information are not collected. Information provided will assist us in developing appropriate mental health systems based upon the needs of our students and families. Please follow the link to complete the survey. Whitnall Baseball is selling tickets to a Milwaukee Brewers game on June 17th in order to play at Miller Park against Greenfield High School on June 7th this upcoming season. They still need to sell over 100 tickets in order to play. Each ticket is for the Outfield Bleachers and is $25. Tickets will be made available for pick up at Whitnall High School. Please fill out this Google Form and get payment (checks to WHS Baseball) to Coach Krey ASAP. Thank you in advance! Does that game not fit your schedule? You can still help Whitnall Baseball meet their goal. Please contact Coach Krey ( bkrey@whitnall.com ) with another date you may want to attend a Brewers game. Your group could make this opportunity a reality! Each year, AFS conducts a fundraiser in May called Kiss a Senior Goodbye. Students, staff, and especially parents can purchase a small bag of Hershey Kisses and add a personalized message, to be delivered to a graduating senior. AFS club members sell during lunches, but the real success comes from parents of seniors, who will purchase these treats for their kids or their kids' friends. AFS will assemble the treat bags with the messages and deliver to seniors the week of the 29th, while the seniors are still in school. To order, click here . Orders are due by May 24. It's the end of the track season! The 7th and 8th grade conference track meet is on Monday, May 21st at Greendale. Congratulations to our track teams on a very successful season! We are getting closer to our fundraising goal! Please support the PTO so that they can continue to offer awesome programs for our students at EES! Thanks to everyone who has registered so far. If you haven’t registered your child, there is still time. Click here for the website. The big event is scheduled for May 24th. The kids and staff are excited! We are still collecting books for our book swap to be held on June 6th. If you have any gently used children’s books your family is no longer reading, please consider donating them to the book swap. With enough donations, every child at EES will take home new and exciting books for their summer reading! Donations may be dropped off at the Edgerton office during regular school hours through May 31st. Thank you! Our 5th graders celebrate their DARE graduation on Thursday, May 24. There will be a Tailgate Thursday from 3:35-5:00 PM for all grades, hosted by our PTO. The proceeds will benefit the Hales Corners Police Department. The HCE School Report was shared at a May 15th PTO meeting. Your can read the report HERE . Remember that Box Tops for Education need to be turned in before the end of the school year. We need to watch the expiration dates so we don’t miss out on earnings! On Wednesday, May 23, we welcome parents and friends to our K5 spring concert at 1 PM. The 1st grade spring concert follows at 1:45 PM.